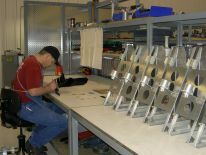 Our customers have realized the value of receiving completed ready to install assemblies and sub-assemblies versus staffing and maintaining an in-house assembly department. Our service is not limited to installation of standard aircraft fasteners and hardware. Our experienced staff assembles a wide variety of complex components such as pressurization controllers, heating & ventilation systems, control system components, battery boxes and racks, electric and hydraulic servos; just to mention a few. With one line item on a purchase order our customers can order, from a single source, a complex component fabricated from raw materials and delivered completely assembled, ready for installation.